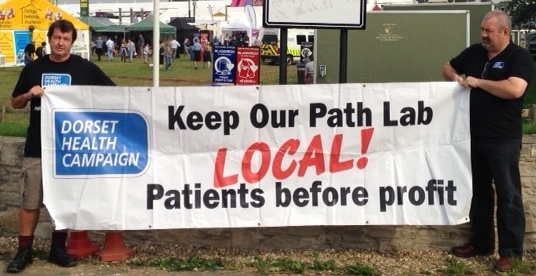 Radical Workers’ Bloc at Tolpuddle 2014, photo by Wheelz. It’s our fifth anniversary! Usual deal: scaring the taxpayers, winding up the Tankies – Winning friends, influencing people and impressing them with our revolutionary praxis. Every year we welcome comrades from as far afield as Wales, France, Spain and the Midlands; we enjoy frank but good-natured debate with fellow trade unionists and activists alike. A small contingent doesn’t want us there, but sod ‘em – The Friendly Society of Agricultural Labourers was an example of working-class self-organisation – Stalin would have had them shot. Still we hope to extend our safe spaces policy to all festival-goers; their kids will learn to swear without our help and please be kind to the cosplay cops, the council would charge a fortune to close the public highway. 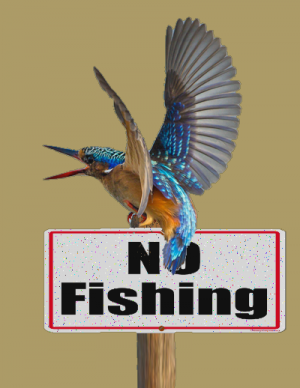 A good start – Kingfisher rising! Just got back from Dorchester where a couple of thousand people marched against the closure of the Kingfisher children’s ward at Dorset County Hospital; estimates vary between one and three thousand. Unless you believe the Echo who put it in the hundreds, odd since they are publicly supporting the campaign. Conspicuous by his absence was ‘Evil Oliver’ Letwin, who has been hedging his bets, he would not have had a pleasant experience, we think. The march was good-natured but shows the strength of feeling in West Dorset about keeping our health services local, it was organised in a week and people required little prompting to turn out. This is a grass-roots phenomenon bubbling up from the ground. The left are running to catch up; what will it take to get the unions to put their weight behind this? The workers at the hospital would be a good place to start. It’s all very well going to the capital a couple of times a year and trudging round in a giant police kettle, which just confirms the centralisation of power and frankly, is an exercise in hand-wringing. Here is an opportunity to strike back against austerity and let’s face it, save lives. It’ been pointed out by a comrade who is a practising midwife that the loss of Paediatric services and the Special Care Baby Unit will make the maternity ward untenable. Next to close will be A & E.
They can then have another go at shutting the pathology lab which was only saved after a similar public outcry last year. Then why not just sell off the rest? We are under no illusions. This is a planned, progressive asset-strip. Letwin would not dream of associating himself with this campaign if he didn’t personally believe it was doomed to failure, so the decision has already been taken, somewhere, and the consultation exercise is just to soften up the public. That doesn’t mean we are going to allow it to happen, if enough people get out to stop it. The health service is a pyramid with a three-cornered base. At its apex are the managers, politicians and ultimately, their corporate masters. At the base are the medical staff, support staff and the patients – all workers and taxpayers. Unite the base and we will cut the top off! Residents of West Dorset and supporters will march through Dorchester on Saturday 13th June, determined to retain paediatric and maternity services at Dorset County Hospital. Meet at 11:00 at Top O Town Car Park Bridport Road, DT1 1XT Dorchester, Dorset. 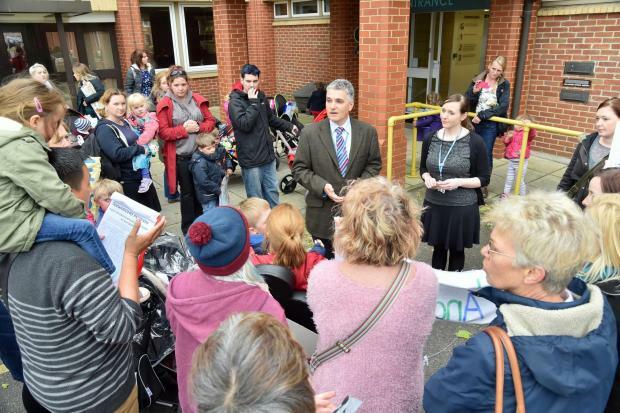 The fight is on to save Dorset County Hospital’s children’s ward; updated. A group of around 30 mothers came together today for a flash demo at Vespasian House, Dorchester, outside a meeting of the Clinical Commissioning Group. The protest, which was self-organised through social media, is over a plot to close the Kingfisher children’s ward and Special Care Baby Unit at Dorset County Hospital and move the service to Poole or Bournemouth They were supported by a member of the local Unite community branch and the driver of a bus stopped to show his support. We hope the campaigners will stick to their guns and not allow themselves to be split up, intimidated, or worse, co-opted by political interests. The most effective movements come from the ground up. More on this as it develops. Residents in West Dorset are suffering from cuts to their bus services that make it hard enough to get to Dorchester let alone Poole or Bournemouth, there is no longer an evening service and some villages have only two buses a day. A recent attempt to flog off the pathology service at the hospital was foiled after a public outcry. West Dorset’s M.P. Oliver Letwin is the author of ‘Privatising the World’ and Britain’s biggest enterprise; his blueprint for selling the NHS. 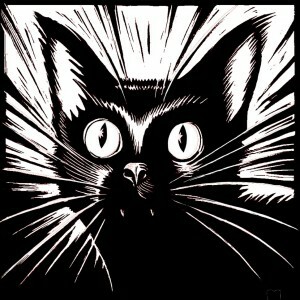 Wessex welcomes new IWW Dorset branch! Industrial Workers of the World Dorset group is in the process of chartering as a branch in its own right, having operated for several years under the auspices of Bristol General Members’ Branch. The paperwork’s all done we’re just waiting for the formalities and should be fully operational in the new year. The IWW is a certified union and can represent you at work, but unlike the TUC unions we’re not shy of direct action and don’t have to pretend we’re all on the same side, we’re not bothered about getting Labour elected and none of us has any ambition to sit in the house of lords! Follow the logo to the side of the page. Victory for Dorset Health Campaign! Community rejects pathology privatisation. “The NHS will last as long as there are folk left with the faith to fight for it” – Aneurin Bevan. The people of Dorset have seen off the piratisation parasites and foiled attempts to flog off the Dorset county hospital’s pathology lab to private contractors out of the county. The directors caved in to the avalanche of public outrage over the profiteering scheme. Demonstrations have been taking place outside the hospital for a year and a petition gathered over 11,000 signatures. This is one up the shitter for ‘evil Oliver’ Letwin the bloodsucking M.P. 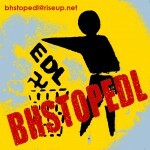 for West Dorset whose manifestation is anticipated in Bridport next month. In September a row erupted over a proposal to spend three and a half grand training the governors and appoint a spokesperson to stop them giving the game away to the media. On Monday midwives at Dorset County Hospital will strike over an ‘insulting’ one percent pay rise. The Royal College of Midwives estimate that if their members, who rely on food banks to survive, began billing the NHS for the 13 hours of overtime they clock up on average over a few weeks, it would increase their pay packets by one percent anyway. The NHS was built by the working class for the working class. 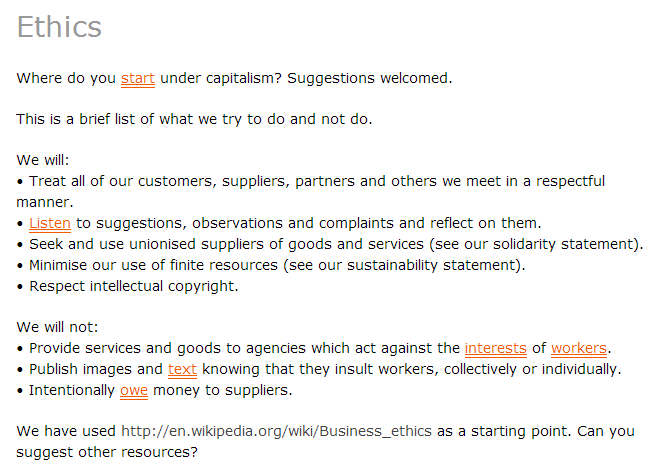 Drugs and medical equipment are made by workers not capitalists. Cleaners, doctors, nurses, midwives, porters and technicians are workers. It belongs to us, it’s not a source of revenue for the socially useless. Keep your filthy grasping bourgeois hands off it! BHstopedl will be mustering outside Dean Park Cricket Ground on Cavendish Road, where we will move as a bloc together onto Dean Park Road and into the back of Horseshoe Common and towards the ‘We Are Bournemouth’ demonstration. Further details will be confirmed in the coming days! Your best bet is to ‘like’ their facebook page for last minute updates. Bournemouth mobilises against fascism! 23rd August. Oppose the racist English Defence League in Bournemouth on 23rd August! Once again this bizarre right-wing cult threatens one of the most peaceful and diverse communities in the south. Their proposed ‘Bournemouth against the Islamification of Britain’ march is a crude provocation to a section of the population that has been here since before most of them were born. A broad-based coalition, ‘We are Bournemouth’ comprising unions, community organisations, traders and individuals from all walks of life has called for a massive, inclusive, family-friendly counter demonstration against racism and fascism. Local antifascist groups such as BHstopEDL, StopEDL Bournemouth and of course ourselves will also be out and about on the day, something for everyone. 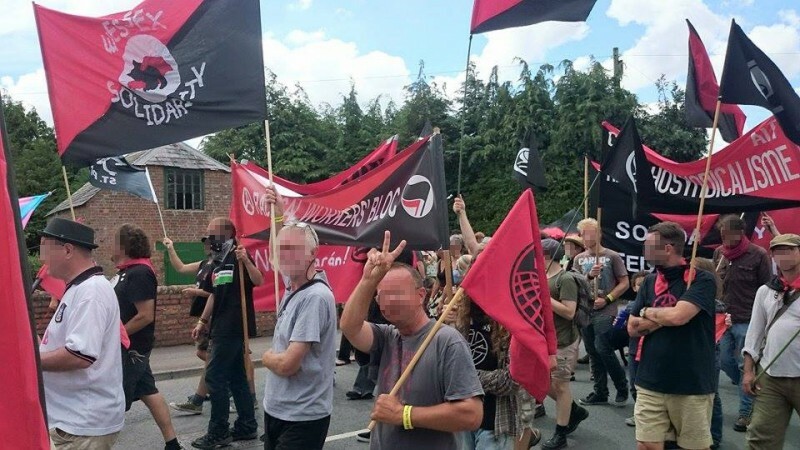 Bournemouth EDL has a history of importing fascists from elsewhere, notably Southampton and Portsmouth, as the blighters have been quite effectively blocked in their own areas, so we call on antifascists from across the south to join us on the day – who knows, you might get to spot one of your local boneheads! The EDL, which mostly focuses its hatred on Muslims but attracts every kind of bigot has suffered badly in recent years from defections, criminal convictions and internal splits, but has somehow stayed under the radar in Dorset – mainly because most people have never heard of it or are unaware of its fascist origins and sinister agenda, and because there are few racial tensions here to exploit – let’s keep it that way. Their new chairman Tim Ablitt, who was Dorset organiser for the BNP splinter group ‘British Freedom Party’, lives at Fitzworth Avenue in Poole. Now, we didn’t make this up, honestly. It was a response to Bournemouth fascist Gary Hazel‘s plea on farcebook for a field where out-of-towners could get heavily refreshed the night before. The cops having refused the fascists permission to use public campsites – not that any would have them – after telling them they aren’t allowed to cook a pig on the beach. See you on the streets – they shall not pass! We take a moment to salute our illustrious comrade John Flower (see below 4th July) who passed away in June, we left a small memorial to him at the annual International Brigades ceremony and antifascists from Wessex, Portsmouth and Southampton attended his funeral. But life is for the living and we had another cracking weekend! We were delighted to welcome four comrades from CNT-AIT Caen this year. Minor drama on Saturday when some prat tried to trash the stall after a specious argument about royalties. His objection was to our use of the ubiquitous John Harris photograph of Lesley Boulton at Orgreave, on this the 30th anniversary of the Miners’ Strike, which could be seen adorning T shirts all over the site. He was safely and efficiently restrained by one of the older members of our group, who also happens to be a photojournalist. We have several NUJ members in the collective who questioned him about his motives. All became clear when we visited his stall which carried similar images at four quid a pop! It turned out he was just some bourgeois flogging lefty posters for the benefit of no one but himself, and he was upset that we were giving away something he was trying to sell. The unseemly fracas didn’t do us any harm as people queued up to tell us – and him, what a prick he was, and our now slightly disheveled literature flew off the stall. He approached the organisers (not us) to offer an apology, and we replied that since he cares so much about money, he could make amends by sticking some in our donations jar, this he failed to do. Numbers on the march down a bit on last year but it was good to welcome some new faces. 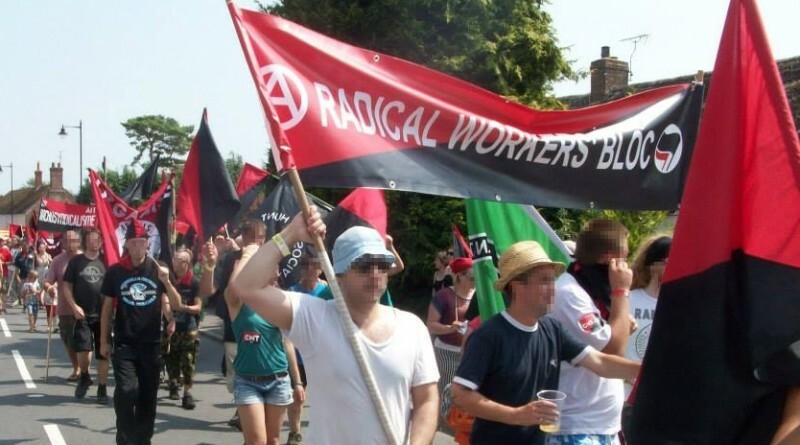 Radical Workers’ Bloc at Tolpuddle 2014. Tolpuddle 2013 Radical Workers’ Bloc: the weekend in pictures. 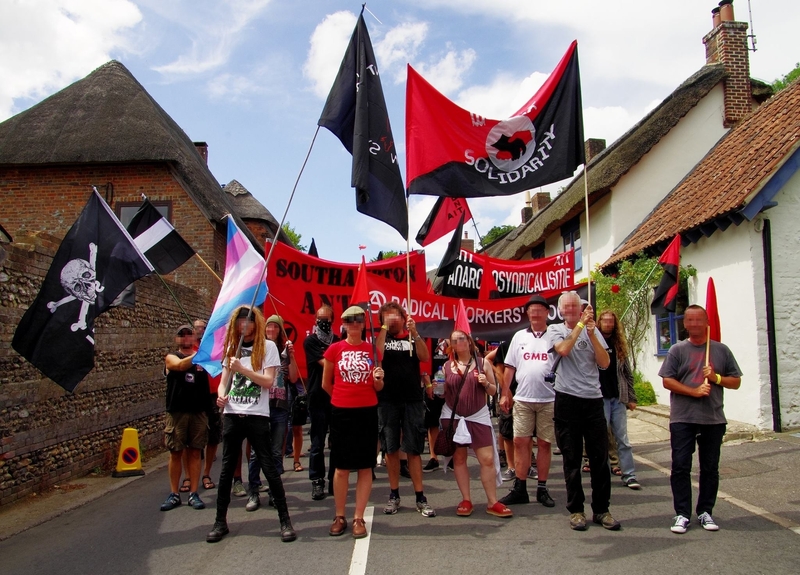 This will be our fourth bloc on the Martyrs Festival and rally; from an inauspicious start with seven of us and a black hanky on a stick, we’ve more than doubled each year to about seventy-five in 2013, from as far afield as Wales, France and the Midlands. Our commitment is to the original spirit of the Martyrs: working class self-organisation in the face of a hostile bourgeois state, more relevant today than ever, owing to the abject failure of political and industrial representation to meet the needs of the people, and the increasingly repressive reaction of the state to autonomous protest and resistance. 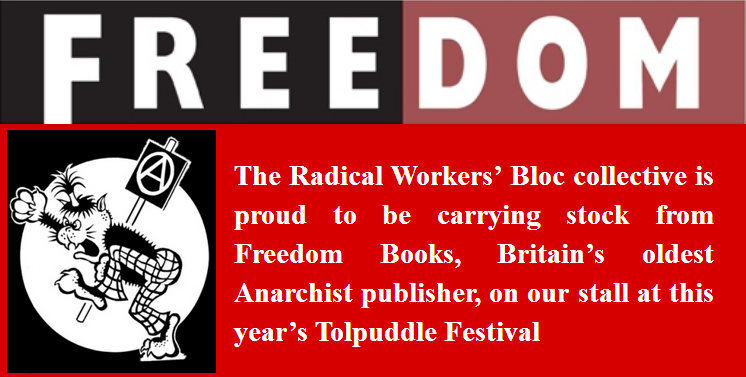 Once again we have a stall in the Martyrs Marquee; we will be carrying stock from Freedom Books, Britain’s oldest anarchist publisher, plus flags, badges, zines and pamphlets for donations, and loads of free stuff. If you’d like to take part and help run the stall, or if you have literature you’d like to give away or accept donations for please get in touch. For those who are staying for the weekend festival, an advance party will arrive on Friday afternoon to pitch tents; we corral them together so that people can get to know each other, exchange contacts and ideas, plan and plot another year of class struggle.